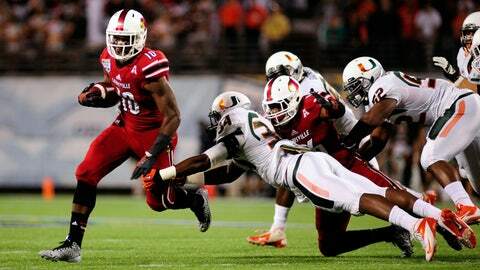 Louisville Cardinals running back Dominique Brown (10) runs in the second quarter in the Russell Athletic Bowl against the Miami Hurricanes at Florida Citrus Bowl Stadium. ORLANDO, Fla. — Miami’s first 10-win season in a decade and first bowl victory since 2006 will have to wait for at least another year. The Hurricanes were no match Saturday night in the Russell Athletic Bowl for Teddy Bridgewater and the Louisville Cardinals in a game that was reminiscent of their last postseason appearance. On that occasion, with the recently-hired Al Golden watching from the sidelines while Jeff Stoutland coached the Hurricanes on an interim basis, Notre Dame raced to a 27-3 halftime lead in the Sun Bowl and coasted to a victory. Bridgewater, who originally committed to Miami before the coaching shake-up, passed for three scores and ran for a fourth to send a considerable chunk of the crowd of 51,098 to the exits early. 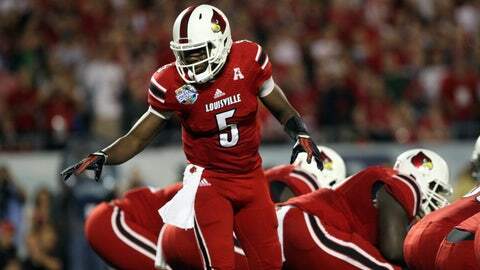 The Hurricanes can't hold off Teddy Bridgewater and the Louisville Cardinals in the Russell Athletic Bowl. 1. Looking for a pass rush early on against Bridgewater? The ‘Canes got it. Thanks to a perfectly timed safety blitz by Deon Bush, Bridgewater’s return to his home state began in less-than-auspicious fashion. Bush, a sophomore whose only other sack this year came in Miami’s rout of USF, easily eluded Louisville fullback Lamar Atkins and hauled down Bridgewater in the end zone for a safety. The Cardinals were forced to start from their own 2 on their first drive after Miami downed a kick by all-Atlantic Coast Conference punter Pat O’Donnell. Luther Robinson was able to get some pressure on Louisville’s next drive, although Bridgewater escaped the rush and delivered a short completion. Tackle Olsen Pierre batted down a pass early in the second quarter. 2. Looking for offense early on? The ‘Canes didn’t get it. Aside from a 17-yard completion from Stephen Morris to tight end Clive Walford on the game’s second play, Miami’s offense looked nothing like the group which averaged more than 446 yards a contest during the regular season. Bridgewater’s 26-yard touchdown pass to wide receiver DeVante Parker did more than give Louisville a 16-2 lead a little more than halfway through the second quarter. The play covered more yards than the Hurricanes had amassed up to that point. A decision to go for it on fourth down and a yard to go backfired when Gus Edwards was hit in the backfield and thrown for a loss of 3. And when Miami finally had a first-and-goal situation in the second quarter, Morris fumbled after being sacked by defensive end Marcus Smith. Tackle Brandon Dunn made the recovery for the Cardinals. 3. Dallas Crawford is probably going to be having nightmares for a while. Twice during the second quarter, the sophomore running back who had to take over after Duke Johnson fractured his ankle against Florida State was absolutely leveled by Louisville linebackers. James Burgess delivered the first bone-jarring hit came after the Hurricanes finally showed signs of life in their running game. Crawford gained 12 and 7 yards on consecutive plays, with the first of those carries giving Miami its first rushing first down of the game. Champ Lee flattened Crawford for a loss of 4 on the ‘Canes’ next drive. Including Louisville’s four sacks of Morris, Miami had only 4 yards rushing on 26 carries going into the fourth quarter, although Crawford picked up 35 yards on 11 attempts over that stretch. 4. Miami’s defense on third downs wasn’t as horrid as the score might suggest. After having major issues in this category against FSU, Virginia Tech and Duke, the Hurricanes acquitted themselves well through the first two quarters. Louisville, which converted 56 percent of its third downs going into the game, was only 2 of 6 in the opening 30 minutes. The problem was that Miami’s offense failed to convert any of their 10 third-down opportunities. Plus, the Cardinals were a perfect 4 of 4 in the third quarter when they increased their lead to 29-2. 5. Where did Allen Hurns go? Hurns had 60 catches for 1,138 yards as the Hurricanes went 9-3 during the season and needed only 19 more yards to break the school single-season record. But after dropping a third-down pass by Morris on the opening drive, he all but disappeared. By the time the Hurricanes finally reached the end zone with 10:23 remaining on Edwards’ 2-yard run, Hurns had two catches for 23 yards.